No longer are heavy, sturdy, expensive mounts and tripods required to photograph deep space. With today’s advances in technology, all that is required is an entry-DSLR and an entry level GoTo telescope. Here is all of the information needed to start photographing the night sky without buying expensive tracking mounts. By using multiple short exposures and combining them with mostly ‘freeware’ computer programs, the effect of image rotation can be minimized to a point where it is undetectable in normal astrophotography, even for a deep-sky object such as a galaxy or nebula. All the processes, techniques, and equipment needed to use inexpensive, lightweight altazimuth and equatorial mounts and very short exposures photography to image deep space objects are explained, step-by-step, in full detail, supported by clear, easy to understand graphics and photographs. Currently available lightweight mounts and tripods are identified and examined from an economic versus capability perspective to help users determine what camera, telescope, and mount is the best fit for them. A similar analysis is presented for entry-level telescopes and mounts sold as bundled packages by the telescope manufacturers. 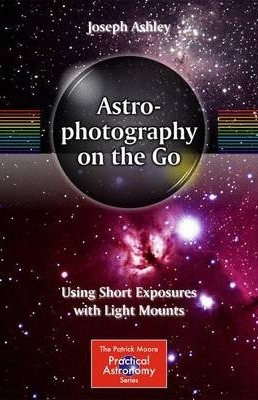 This book lifts the veil of mystery from the creation of deep space photographs and makes astrophotography affordable and accessible to most amateur astronomers.